Gone Fishing » Blog Archive » Paradise & Onrus Caravan Parks. 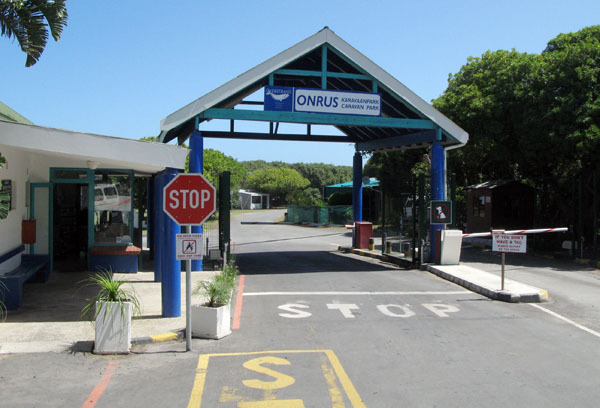 In the Hermanus area there are 2 caravan parks, the one at Onrus and the one I stayed at Paradise Park in Vermont. 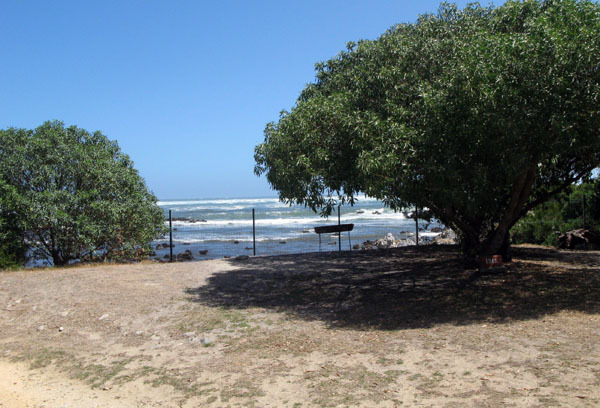 There was a great camping and caravan park in Hermanus, I camped there many years ago, but it is no longer open to the public as it has been earmarked for a major development . The main reason I ended up staying at Paradise Park was price. 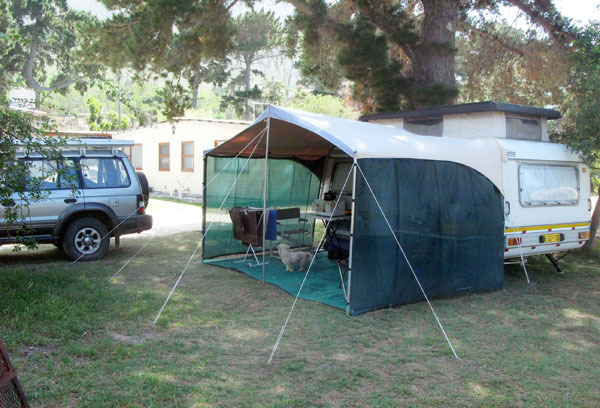 When I phoned around to check prices I discovered that Onrus Caravan Park, like Kleinmond & Palmiet, who all fall under the same municipality, wanted to charge me R240 per night which is just way over what I am prepared to pay. Fortunately Paradise said that they would charge R130 per night, which I think is still a bit high for 1 person per night. 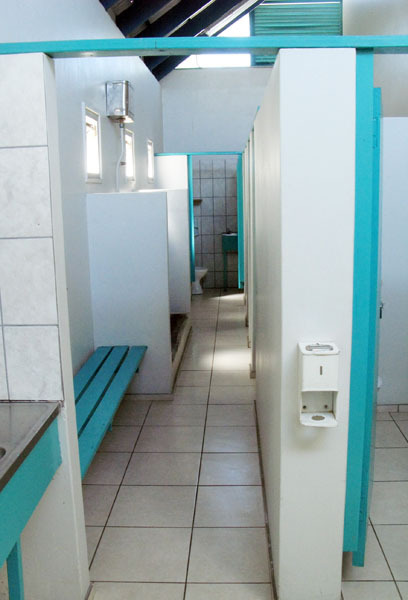 The highest price I paid on the West Coast was at Strandfontein, where I had a private ablution block and fabulous view of the sea, who charged me R85 p/n during the week and R125 p/n over weekends. The biggest factor against Paradise Park is that it is close to the high way and is therefore a bit noisy at night but not unbearably so. It is, compared to the Onrus park, also quite far away from the beach area which did not bother me as they have a great pool there to cool off in. 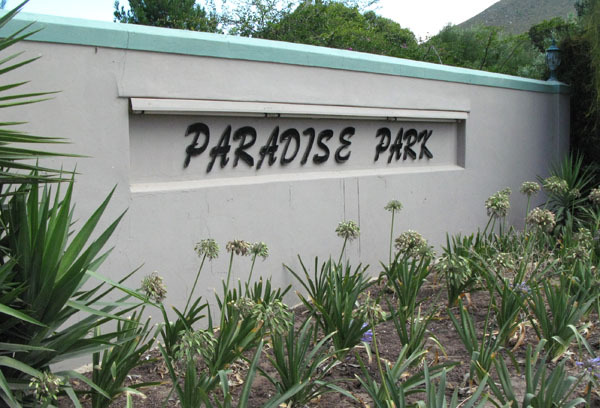 Paradise Park just off the R43 in Vermont about 10 km’s from Hermanus. No security at gate. My set-up. Nice shaded area and the grass was fine. Had some great companionship as these two decided that my front stoep was the best place in the park . 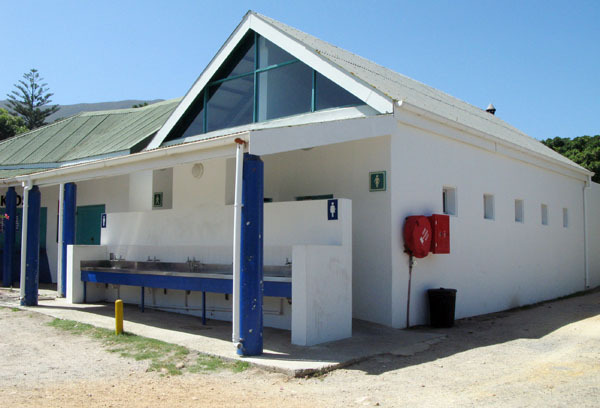 The main ablution block which was pretty good. There was also a smaller block nearer to where I was parked but there was something wrong with the hot water in the showers. 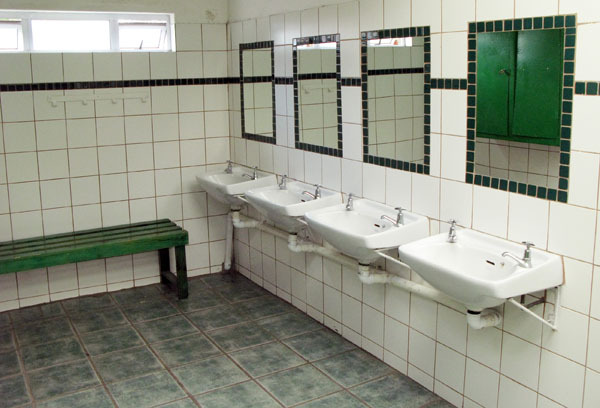 The ablutions were kept clean and tidy. You also have your own key to get in and out for which you pay R50 which is refunded when you leave. The pool and right next to it was a children’s play area. There are quite a number of full time residence in the park who have built there own cottages and pay a monthly levy. There was one very nice one up for sale for R350k and I was tempted but worried about the road noise. There is also a shop which stocks all the basics and next to it a hall which was used for a wedding reception while I was there. All in all I enjoyed my stay at Paradise Park and would definitely stay there again as it gives you a great base from which to go and explore the area. Onrus Caravan Park. Good security entrance. 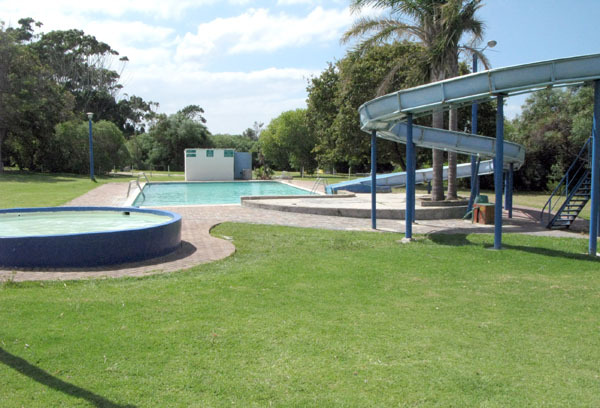 To be honest, apart from the price and also the now extended high season to end of April (which is crazy) there was not much wrong with the park and it is right on the shore line so maybe for a family of 4 to pay R240 p/n is not too bad. 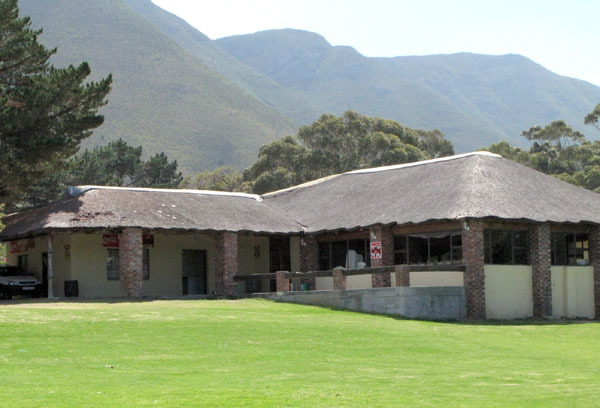 I still believe that the pricing structures of most parks are wrong in that they have a blanket charge for the site and don’t work on a charge per person p/n as they do at Chapman’s Peak Caravan Park which works very well. 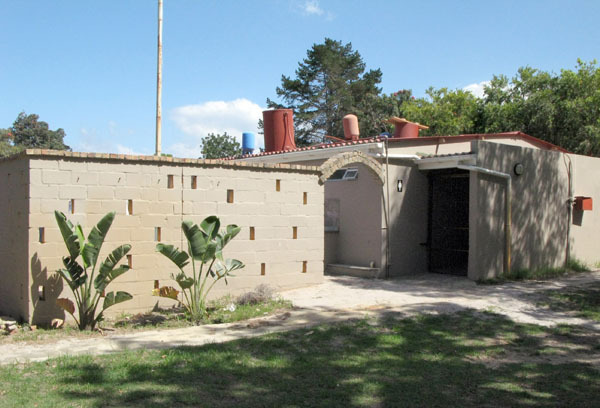 One of the ablution blocks. Clean and tidy. I sometimes wonder who designs these things!! The most popular sites with a sea view were looking a bit the worse for wear which is understandable. 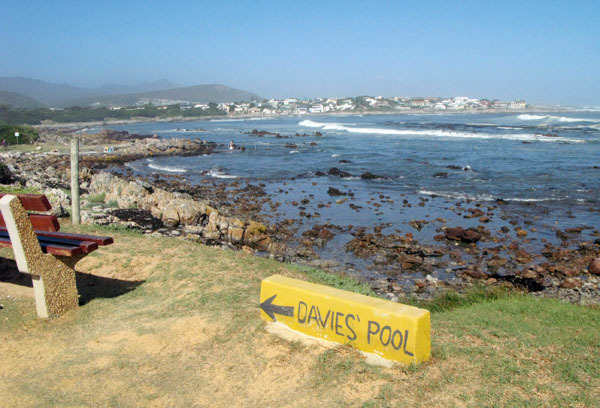 Davies Pool which is directly in front of the park and is accessible via a gate. I had a long chat to the manager who says that they realise that they have made a mistake with the pricing and extending the high season and that he hopes that by June this year the prices will have come down. For the mean time if you are only going for a weekend and feeling flush this looked a nice park to stay. Hi Pat, we were recently your neighbours at Chapman’s Peak caravan farm. (The autovilla and beach buggy duo). 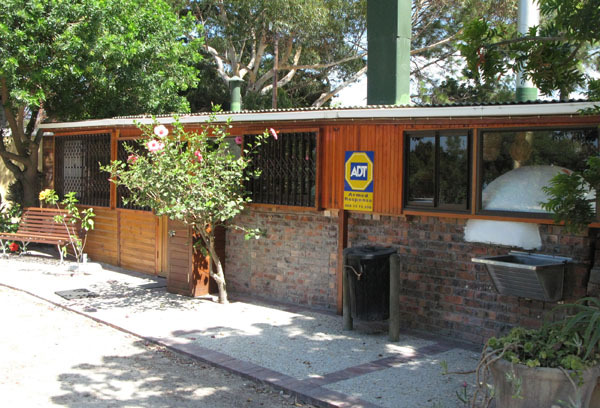 We would like to comment on the photo taken of your two companions at Paradise Caravan Park, Hermanus. We also became very well acquainted with the supposed to be white maltese poodle, named snowy, which became white again the day Charmaine and I were doing our washing at the laundry. While waiting for the washing machines and tumble dryers we decided to give snowy a bath as he was riddled with fleas. (Don’t worry, we didn’t put him into the washing machines but gave him a handwash outside in cold water and sunlight soap). Needless to say, not long after that he was snow white and a very happy chappy! Now we could enjoy his company and spoil him as well. His friend is the jack russell named Eva (afrikaans for Eve), who also was a regular visitor. 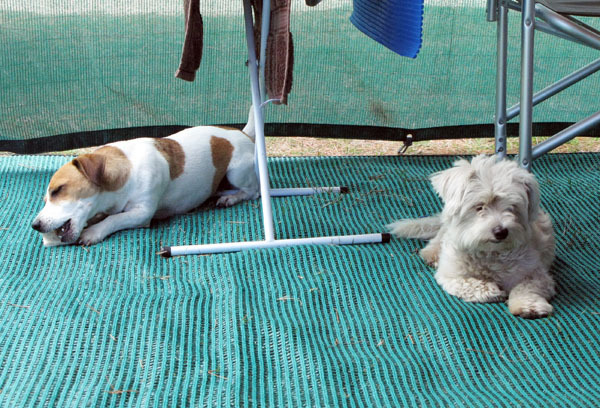 These two dogs seem to be very clever, making the most of the campers and getting spoilt rotten as they made us feel very special by attacking any passers-by, taking their task as self-appointed guard dogs very serious. On our daily return to camp they would also be waiting loyaly on our stoep. Enjoy the company of these twol friends! Hi Carol glad to see you got the 3G working. I also thought about giving Snowy a bath while I was there but was not to sure how the lady owner would take it. Good for you! Hope you got to Yzerfontein okay.